Despite being full of cold, Rosalie put in a valiant effort with the yogurt painting yesterday. Some babies like to snuggle when they’re sick, but Rosalie isn’t really a cuddly kind of baby, so I thought distraction would be the best way to tackle the cold. It seemed to work, and it wore her out so she napped well too! So, yogurt painting! So simple, you’ll kick yourself for not trying it already! Literally all you need is greek yogurt (none of that low fat rubbish, you want the good thick, creamy stuff) and food colourings. I used a paper plate and put some blobs of yogurt on it, then added a few drops of food colouring, mixing the colours as required, to produce the desired paints. I usually tape the paper to the highchair tray to stop it from moving around. 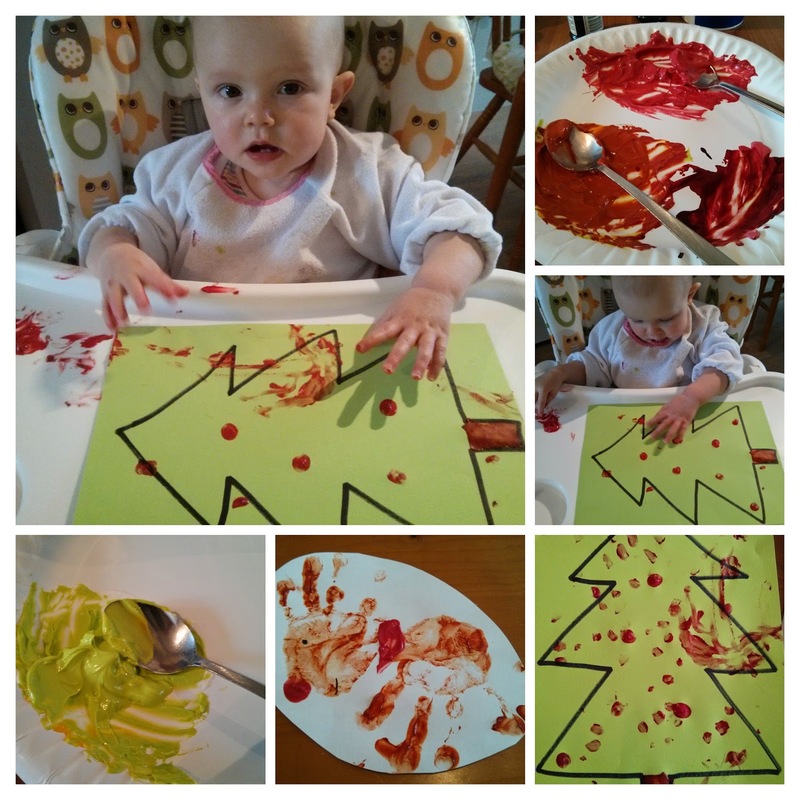 At first I just let Rosalie loose with some green yogurt paint and plain piece of paper; she found the texture funny and, no surprise, put her fingers straight into her mouth, but that’s ok because yogurt paint is totally edible! Once I’d let her explore on her own I decided it was time to get down to business! I drew a crude Christmas tree onto green paper and encouraged R to use her fingers in the red paint to create baubles. It went rather well I think! Mother’s proud blindness perhaps?! I love doing messy play with Rosalie, I think it’s good fun, even though the clearing up usually takes as long if not longer than the activity itself! What about you? What a fantastic idea! I wrote about the other end of the child age spectrum – we've moved on to baking – eeek!